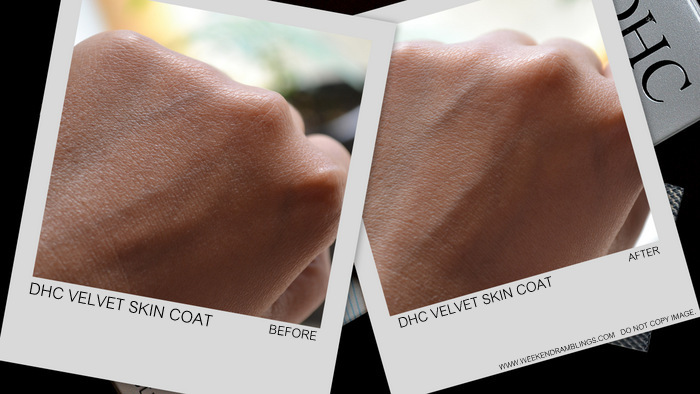 DHC Velvet Skin Coat Makeup Primer - Once you slide this inconspicuous primer between your skin and your foundation, you'll never know how you lived without it. It evens out coverage by filling in creases and fine lines and smoothing over rough patches, so your face appears flawless. The unique texture of this powdery gel is unlike any you've ever felt - it's not sticky or greasy, making it a favorite among professional makeup artists. With its ability to keep oil in check, you'll even forget there were such things as makeup mishaps. Not for use on lips. The DHC Velvet Coat is a silicone-based makeup primer that promises to smoothen out fine lines and visible pores, providing an even canvas for the foundation to go on. It comes packaged in a tube that helps keep the product clean and also prevents it from drying out. The product itself is an opaque gel-like substance, and it feels almost like a powdery wax. After I apply my moisturizer and give it a little time to absorb into my skin, I use about the amount I have shown in the earlier photo and just gently pat into my entire face. The consistency of the product is such that it spreads easily and forms almost like a coating over the skin. The finish is velvety matte - there is a bit of a slip from the silicones and a powdery finish to it. Once I am done applying the primer, I follow this up with my regular foundation or tinted moisturizer. The one thing to remember is to use really little of this product and add more if you need to later. A thin layer is what works best - if you apply a thicker layer or excess of this product, you will actually find it flaking off the skin, sort of similar to how candle wax would! As you can see in the photo, the DHC Velvet Skin Coat Makeup Primer does a great job at filling out fine lines and sort of blurring them out and providing an evenness to the skin. While it doesn't really shrink pores, it does make them look a lot less obvious. I also feel like I need less of the foundation/tinted moisturizer than what I use regularly (without primer). This also works great on its own if you want to step out without any makeup but still want your face to look fresh and healthy. I haven't had any issues with it so far, but because of its high silicone content I am not too sure how the DHC Velvet Skin Coat Makeup Primer would work with acne-prone skin when used on a daily basis. I step out of the house(and/or use makeup) mostly on the weekends, so I am not really a good judge on skin reactions with daily use. Product provided by the brand for review. Sounds interesting. Havent tried many primers so far.